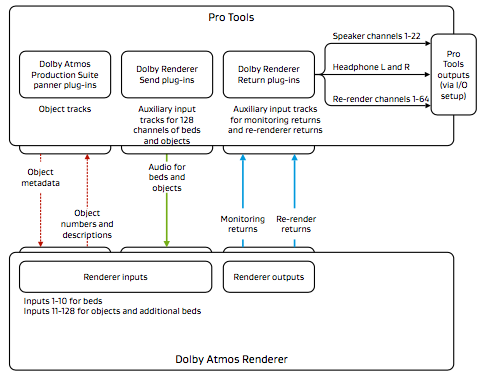 Since the last time I wrote about the Dolby Atmos Local Renderer, there has been an update by Dolby on this. I also got quite a few requests from our readers to cover this too. So, this time I thought I would write on this. I won’t be explaining on the VR workflow in this note as that is not directly related to Film Sound. Unlike the earlier Local Renderer, this time, you buy the Dolby Atmos Production Suite from the Avid Webstore and you can do your premixes or Sound Design using this. The purpose of this Production Suite as a local renderer still remains the same as the older one. There are some things that need to be kept in mind about what it is and what it is not. So, with this, you still need to keep in mind that it is NOT meant for full fledged theatre or cinema workflow. For that, you would still need a Dolby Approved mix room and the hardware RMU. The signal flow for this remains the same as what was with the earlier Local Renderer. There are some minor changes as before the renderer app was hidden from view to the user and the room modes were something that you would set up when you installed it. (Is it 7.1.2 or 7.1.4 etc). The Number of outputs compared to the earlier Renderer have also increased to 22 from the earlier 16. The basic principle of the renderer still remains the same as my the earlier blog entry. Multimono Plug-in If the Renderer Send can be inserted on a 7.1.2 Aux. 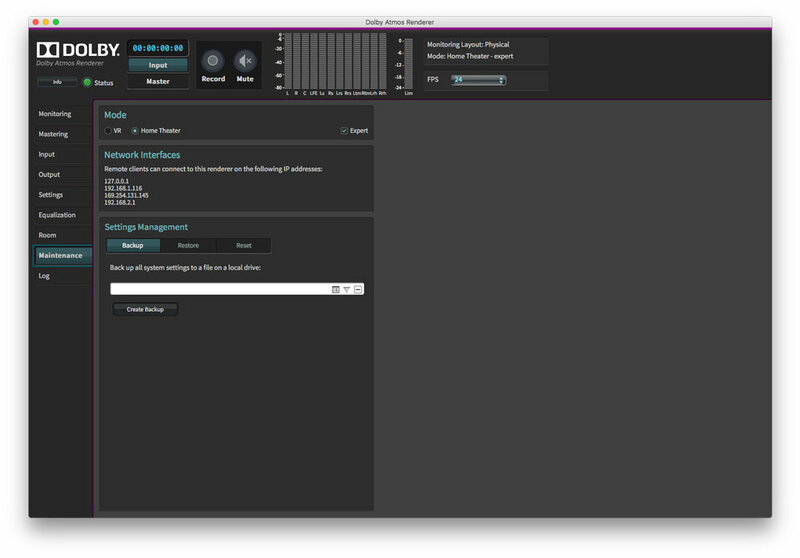 You now have the ability to also have Re-Render returns to Pro Tools if you want to record down-renders of your stems. On the right, there is an option to use Spacial Coding for Monitoring. This is derived from the way Bluray is encoded. In a Bluray, the 118 objects are condensed to fewer elements. This is done by grouping sound elements into clusters that occupy the same positional space and pushing that to the speaker output. This reduces the number of channels needed to encode. This same principle is used in this case too. If so, why is that an option to turn on and off? The answer is simple. You only turn it on if you are working with full mixes like QC or editing a full mix session etc. If you are doing Track-Lay or Sound design etc, it would be better to turn it off because otherwise when you pan you may hear positional artefacts because of the way the algorithm functions. The Room Tab is where you set up the renderer to function based on your Room. In the older version, when you install, you had the option of choosing 9.1, 11.1, etc. That is now gone. This mode gives you much more flexibility to address more speakers and your room. If you look, there are tick boxes that let you choose speaker positions in the room. This will be enabled once you click edit. (It shows as Cancel and Save because I clicked Edit). Once you tick all the right boxes, you need to set up the routing number below in the drop down box. This is very important as this reflects how it is returned in Pro Tools where you have the renderer return. So for example if you have set up the routing as L:1, C:3 and R:2, in the renderer return within your Pro Tools Session you will route 1 to L, 2 to R and 3 to C. You can change it to be LCR too by changing the routing number in this screen. This is a one time setup that you need to do based on your room, and you also have the flexibility to put up delay for the speakers too. Just beside the Physical tab, you have the Monitoring Tab where as I mentioned earlier, you can create custom monitoring formats. The Mastering Tab is what allows you to do a QC, create your Bluray Master etc. I am not getting into the nitty gritty of this as it is beyond the scope of the current article, but I will explain some of the features here. The best thing about this is that you no longer need an RMU to play back an existing Atmos MXF file. You can load it into the master file section and then once done, click Set. This will lock the MXF in your renderer. Once that is done, you can simply click Master (the button just below Input on the top) and hear the Atmos mix via your Pro Tools Session if you have the Local Renderer set up. An additional feature this gives, if you are say doing a version mix, is you can load the original mix in this and have the version mix in Pro Tools. Once done, you can switch between Input and Master in the Renderer app to switch between the original and the Version mix to do an A/B. This is a very cool feature. The other major advantage is once you have loaded your MXF, you can do offline renders to 7.1, 5.1 or stereo from that Atmos mix. 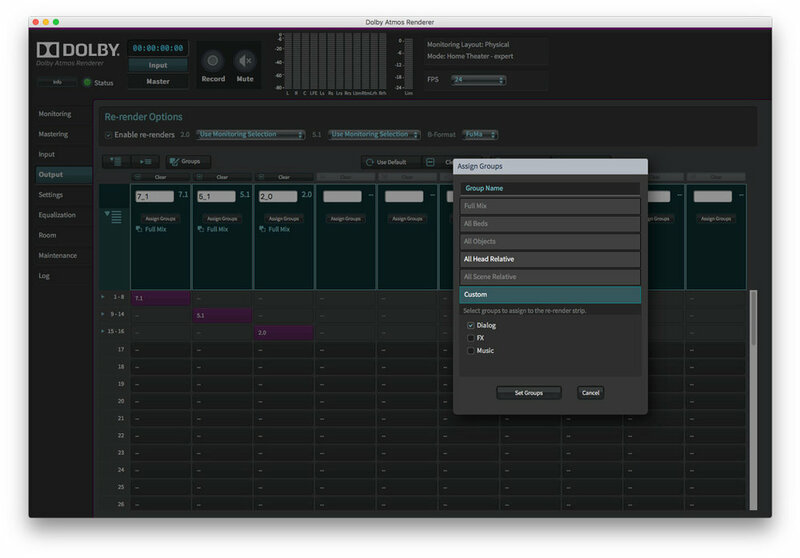 This tab will set up everything that is reflected in the Dolby Renderer Return plugin within Pro Tools. From the above screenshot, you can see that you have an option of 64 outputs that you can set up to do downmix or re-renders. Within this, you can set up say the first 8 to be 7.1, next 6 to be 5.1, the next 8 to be the 7.1 of FX+Music, the next 8 to be DX, Next 8 to be FX etc etc. As you can see, in one go, you are able to make full down-renders and create your stems. You no longer need to run everything again just for these deliverables. Both these options can also be imported from the Main Mix room where you have an RMU and you can then take your mix and do these re-renders in a different room if you wish to do so too. This tab provides for Room EQ. You can set this up by playing Pink Noise (or other test tones like 100Hz, 1k, 10k, Sweep, Thump etc) and using any Room measurement to find the values to be done for the EQ. Every Speaker except the LFE has a 27 band EQ with Frequency, Q and Gain (-6 to +6) parameters. You can also set the gain for each speaker from -16 to +16 dB. But remember that doing an EQ in this will increase the CPU usage on your system. This tab is where you set up the renderer to work based on what workflow you are doing. You have to make sure to remember to set it to Home Theatre if you plan on using the Object plugins or Atmos Workflow in Pro Tools. If not, you will get error messages and warnings as the modes are different. This is a basic overview of the Renderer Application itself. The setup for Pro Tools isn't much different from what it used to be. The good thing is Dolby provides templates for you to start working as soon as you install the Renderer. I am also sharing my personal mix template that I use for my mixes (built on Pro Tools 12.8). Also, remember that the templates are just starting points and get complex or simpler depending on the movie. I have hidden the return Auxes to make it visually less complex. Make sure you check out and update to Pro Tools 12.8HD. That has changed the way I approach my mix and has made my life extremely and immensely easier and simpler to handle work no matter how complex it is.